This year's Walk for Hope event will feature The Steel Wheels, a Harrisonburg-based band featuring three EMU alumni, and Keith Morris, a past president and current board member of the Collins Center, which addresses child sexual abuse in Harrisonburg and Rockingham County. The Steel Wheels are cruising into Eastern Mennonite University from a Northeast tour on Saturday, March 29, just in time for a cause close to their hearts. A few years ago, songwriter and lead singer Trent Wagler ’02 wrote “Lay Down Lay Low,” based on the true story of a friend who contemplated suicide but did not go through with it. That song, the title track of the Steel Wheels’ 2012 album, will surely be on the playlist Saturday afternoon during the third annual Walk For Hope. Walk For Hope unites students from Blue Ridge Community College, Bridgewater College, Eastern Mennonite University and James Madison University to raise awareness about depression and suicide. The walk and all afternoon activities are free and open to the public. People whose lives have been affected by mental illness, either personally or through friends and family, are especially encouraged to attend. Organizers predict this year’s event will be especially powerful. The Steel Wheels, which include Eric Brubaker ’01, Brian Dickel ’98, and Jay Lapp, are also bringing that special friend on stage to share the story of his struggles with depression and past abuse, and how he came to make a different, life-saving choice. Keith Morris ’83 is past president and current board member of the Collins Center, which addresses child sexual abuse in Harrisonburg and Rockingham County. The event kicks off at 11:30 a.m. with a 2.2-mile walk from JMU’s Memorial Hall in downtown Harrisonburg along High Street/Virginia Avenue to the EMU campus. In the past, walkers and an administrator from each school marched separately to a common location, but this year, in a show of solidarity, all will walk together. Walk For Hope T-shirts, free to pre-registered participants, will be brightly tie-dyed in school colors. 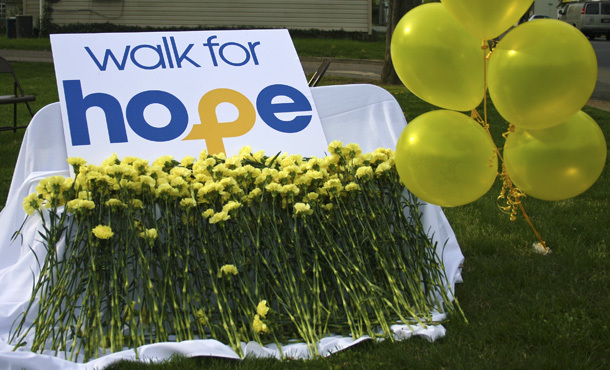 Since it began in 2012, Walk for Hope has increased in size each year. That growth may come as the result of a tragic fact: Most college students know someone who has suffered from depression or anxiety, contemplated suicide or died by suicide. The second leading cause of death among college students is suicide, according to a 2012 study by the American College Counseling Association. ULifeline.org reports that depression and anxiety are more common among college students than back pain, sinus ailments, and allergies. Raising awareness and providing support are two goals of the Austin Frazier Memorial Fund, which co-sponsors Walk for Hope and also funds an innovative mentoring program at EMU called CoachLink. The program began after Austin Frazier, a junior at James Madison University, died in 2009 after a long battle with bipolar disorder. “This CoachLink program and Walk for Hope were concepts presented to local colleges by his father, Bibb Frazier,” says Hostetler, one of five coaches in the CoachLink program. “Both are ways to honor Austin’s memory, to acknowledge that there is hope for all those who experience the effects of depression and suicidal thoughts, and to provide support and resources to students who may need it.” Bibb Frazier is the owner of the nearby Frazier Quarry, which supplied limestone seen on EMU’s buildings and grounds. The event is co-sponsored by the Austin Frazier Memorial Fund, EMU, JMU, Bridgewater College, and Sentara RMH Behavioral Health. To receive a free t-shirt, pre-register at Walk For Hope’s Facebook page.